A study into the hydra's incredible powers of regeneration has yielded evidence that shorn off parts of the tiny aqua creature store a body structure ‘memory’. Hydras, which are less than an inch in size, are a biological wonder in that they can regenerate into fully grown adults even after being dismembered. While small segments from the unusual-looking creature can heal, it is usually parts of a hydra’s midsection that can generally grow again into full-size organisms. The animal’s abilities to regrow are similar but less monstrous to the one’s of the fabled many-headed Lernaean Hydra serpent in Greek and Roman mythology. Now a study into the tentacled polyp creature has put forward further compelling explanations behind how a bisected hydra can effectively divide and live on. According to the study, conducted by researchers from the Israel Institute of Technology and published in Cell Reports, excised fragments “inherit” the tissue formation from the cytoskeleton of a dissociated hydra. “The inherited action organization determines the body axis in regenerating tissues,” the research states. A cytoskeleton contains a bunch of microfilaments, microtubules, and filaments, and make up the inner framework of a cell. 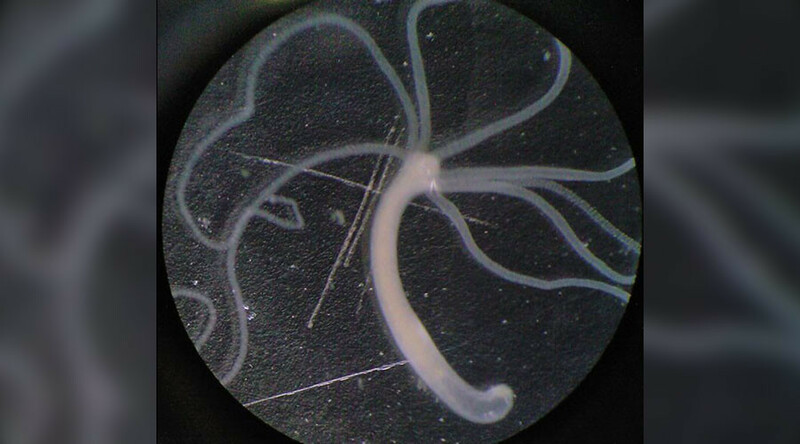 In the study, the hydra’s regeneration process is likened to a structural memory or “mechanical feedback”, which inform body parts how to regrow into a full animal. “The excised tissue segments carry a memory of the original body axis, which is inherited from the parent animal,” the study states.